Let's meet a KING and be inspired by her. As you read, I hope you get inspired, I know I sure will. ENJOY! Serena Jameka Williams (born September 26, 1981) is an American professional tennis player who is ranked No. 1 in women's singles tennis. The Women's Tennis Association (WTA) has ranked her World No. 1 in singles on six separate occasions. She became the World No. 1 for the first time on July 8, 2002, and achieved this ranking for the sixth time on February 18, 2013, becoming the oldest world No. 1 player in WTA's history. She is the reigning Australian Open, French Open, US Open, WTA Tour Championships and Olympic ladies singles champion. Williams is widely regarded by many tennis commentators and tennis legends as the greatest player of all times. 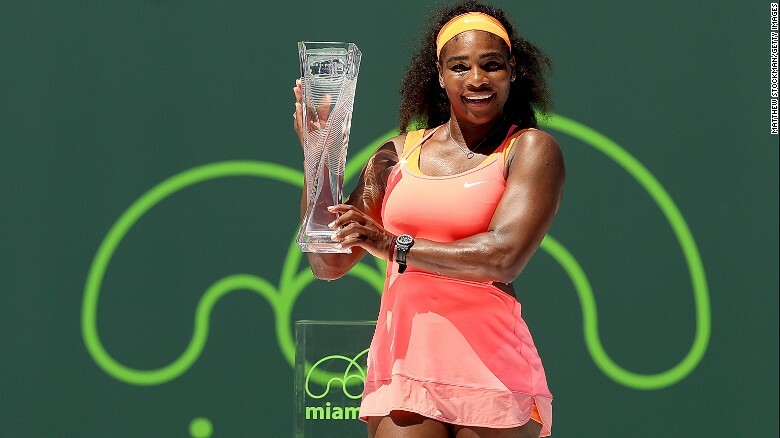 Frequently hailed as the Queen of the Court by the general media,[ Williams holds the most major singles, doubles, and mixed doubles titles combined amongst active players, male or female. Her record of 35 Grand Slam titles puts her seventh on the all-time list: 20 in singles, 13 in women's doubles, and two in mixed doubles. She is the most recent player, male or female, to have held all four Grand Slam singles titles simultaneously (2002–03), and the fifth woman ever to do so. She is also the most recent player together with her sister Venus Williams to have held all four Grand Slam women's doubles titles simultaneously (2009–10). Her total of 20 Grand Slam singles titles is third on the all-time list behind Margaret Court (24, of which 11 open era titles) and Steffi Graf (22 titles), and second in the Open Era, behind only Graf. She has won 13 Grand Slam doubles titles with her sister Venus and the pair are unbeaten in Grand Slam finals. Williams is also a five-time winner of the WTA Tour Championships. The arrival of the Williams sisters has been credited with launching a new era of power in women's tennis. Williams has won four Olympic gold medals, one in women's singles and three in women's doubles, an all-time record shared with her sister Venus Williams. Williams is primarily a baseline player and her game is built around taking immediate control of rallies with her powerful and consistent serve, return of serve, and forceful groundstrokes from both her forehand and backhand swings. Williams's forehand is considered to be among the most powerful shots in the women's game as is her double-handed backhand. Williams strikes her backhand groundstroke using an open stance, and uses the same open stance for her forehand. Williams's aggressive play, a "high risk" style, is balanced in part by her serve, which is considered to be the greatest in women's tennis history. She consistently projects great pace in her serves and in the 2013 Australian Open, she had a peak serve speed of 126.8 mph (204.1 km/h) which is the third-fastest all-time among female players (only Venus's 129 mph and Sabine Lisicki's 131 mph recorded speeds are faster). What makes her serve even more deadly is her ball placement and her ability to consistently place powerful shots with great accuracy. At the 2012 Wimbledon Championships, Serena hit a women's tournament record of 102 aces which was more than any of the men hit during the two weeks. Williams also possesses a very solid and powerful overhead. Her main weakness is her volley and slice. Although many think of Williams as only an offensive player, she also plays a strong defensive game. Williams is also known for her mental toughness and her ability to come back from improbable situations. She has won three Grand Slam singles titles after saving match points (2003 Australian Open versus Kim Clijsters, 2005 Australian Open versus Maria Sharapova, and 2009 Wimbledon versus Elena Dementieva), more than any other player in history, male or female. In the 2012 US Open final against Victoria Azarenka, she was down 5–3 in the third set and found herself two points away from losing the match. Williams then proceeded to win the next 4 games and defeated Azarenka. She also came back from a 3-5 deficit in the third set against Kim Clijsters in the 1999 US Open and went on to win her first Grand Slam singles title. In recent years, Williams has shown an ability to serve aces at critical moments. One of these instances was the 2013 French Open final, where in the last game of the match, she fired three aces, including one clocked at 123 mph (198 km/h) on match point.